This series is part of Scholastic’s early chapter book line called Branches, which is aimed at newly independent readers: easy-to-read text, high-interest content, fast-paced plots, and illustrations on every page. Tank is a clumsy, outgoing Great Dane. Haggis is a dapper, grumpy Scottie dog. 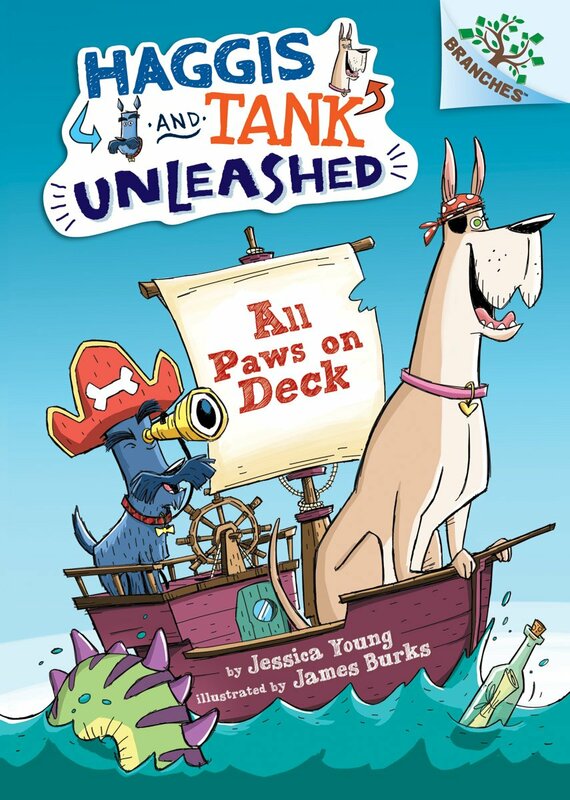 In the first book in the series, Haggis and Tank set sail as pirates. At first, Haggis doesn’t see what Tank does—that an adventure awaits them with just a little imagination! But soon, Haggis joins in the fun and the two friends go on a pirate adventure. They talk like pirates, swab the deck, and even search for buried treasure. 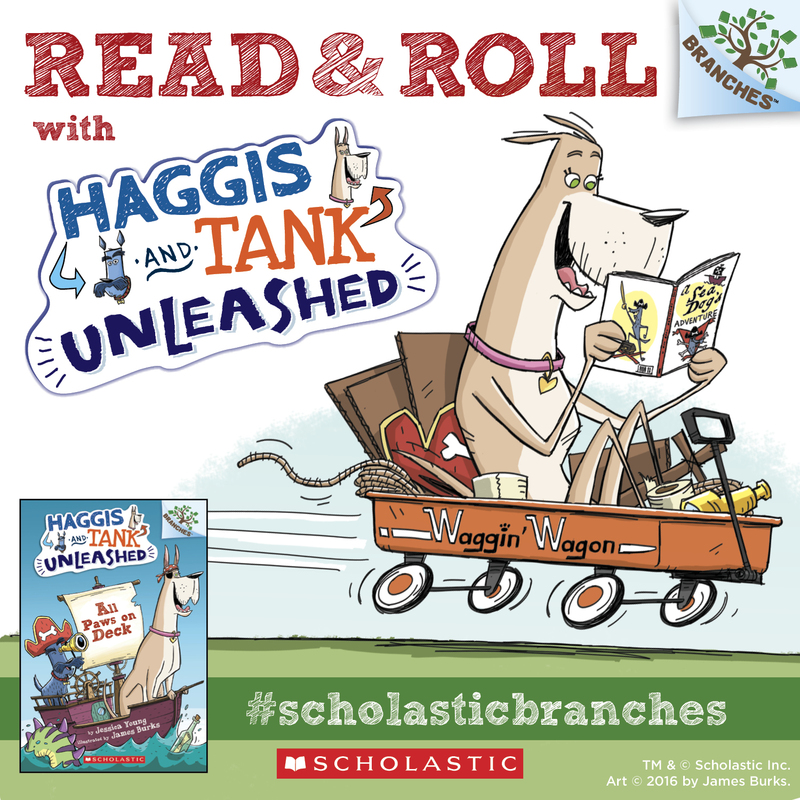 This series is full of wordplay and homophones that make Haggis and Tank’s adventures even more fun! Print Haggis and Tank Unleashed activity sheets and resources: Homophone Hunt, Design Your Own Pirate Flag, Create Your Own Dialogue, Packing Light, Same and Different, After Reading Guide, additional activities and lesson ideas. Order HAGGIS AND TANK — ALL PAWS ON DECK by clicking one of the links below. 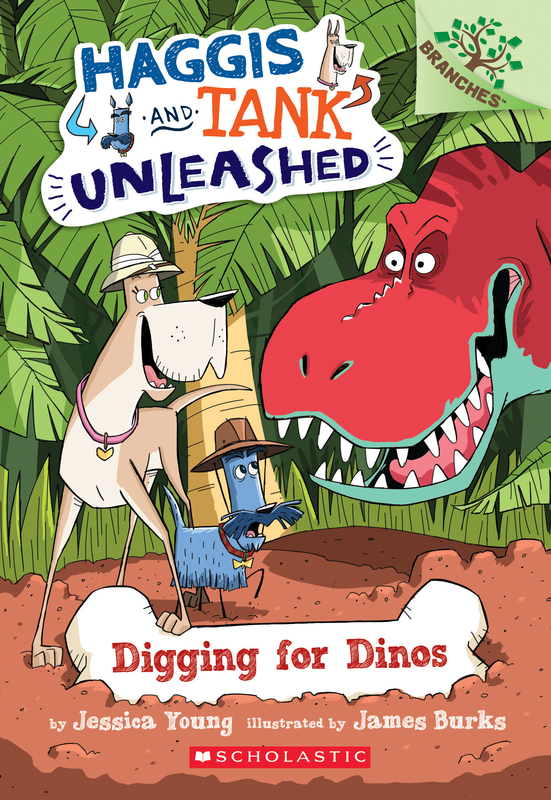 Haggis and Tank’s big imaginations take them on a search for real live dinosaurs! They build a nest for dino eggs and play baseball with a triceratops. But then the ground starts shaking. Is a T-rex chasing Haggis and Tank? Or could something else be headed their way? Order HAGGIS AND TANK — DIGGING FOR DINOS by clicking one of the links below. 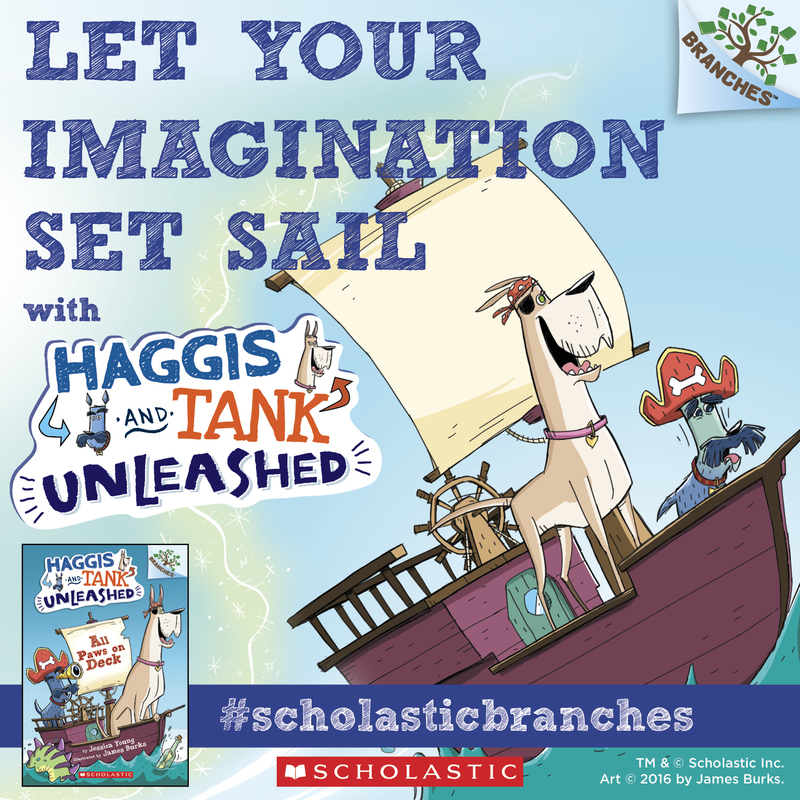 Haggis and Tank’s imaginations take them across the globe — to Scotland! They fly an airplane, get lost in a bog, visit a castle, and even play the bagpipes. Then they get chased by a . . . werewolf?! How will they get home? Order HAGGIS AND TANK — HOWL AT THE MOON by clicking one of the links below.